Share your hospitality with friends and family! Sun in your eyes? Keep the sun at bay and show your support for The Charity League with this great one-size baseball cap, embroidered with The Charity League logo. Shipping included. A great summer package of a one-size baseball cap to keep the sun off your face, and an insulated acrylic cup to keep your favorite summer beverage cool. Shipping included. Order two (2) of our great insulated acrylic cups; one for yourself, one for a friend. Shipping Included. They'll love to explore and savor this unique collection of easy-to-follow recipes in this cookbook created by our current and past members. 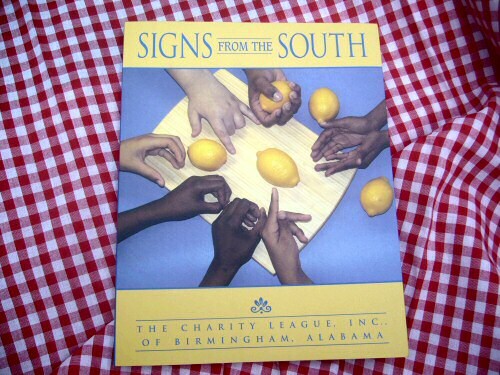 Signs From The South makes a great gift for teachers, aunts, moms, daughters, bridge partners, running partners, team members, colleagues, and anyone who likes to share Southern Hospitality. $21.55 includes shipping!!! Buy extra copies for firends, family, teachers!!!! ONLY $10 each for additional copies (Shipping Included). I wish to make a donation to The Charity League in addition to my merchandise purchase!